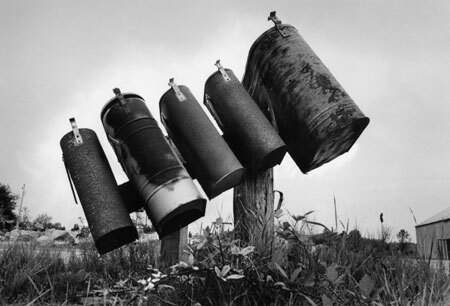 At one time these five mailboxes stood upright on a large and sturdy platform frame. In time, a newspaper box or two was attached to make all known information links available for these businesses and residences. Today however, the framework for these postal customers has all but fallen to the ground. The mailbox openings face upward as if they were waiting for overdue air mail deliveries. These once vital communication links have been severed or drastically altered and this spectacle brings up many questions that are difficult to explain now with no one around to ask. At first it is hard to imagine that five close by addresses are no longer valid. Secondly, it now seems that someone should have removed this eyesore. It is also a potential roadside hazard waiting to happen since the original supporting structure is jeopardized. Then again with a new era of paper less communication, land use zoning changes, business closures and the preferences for higher security post office box rentals we can imagine this scene happening elsewhere. When we see outdated remnants of the past in our own life needing deletion, we surely know others see them as well.